Yesterday, I had the opportunity to present at the EclipseDay at the Googleplex event which hosted around 100 eclipse enthusiasts. 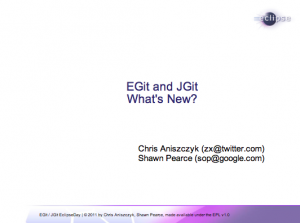 Shawn Pearce and I gave an update on the work going on in the EGit and JGit projects as we prepare for the 1.2 release later this month. I’m very proud of the progress the two projects have made since we fought to have the projects move to eclipse.org and build a community there. It’s amazing to see JGit being used on Android via Agit and even have some crazy folks automagically port JGit to C# (NGit) to enable Git usage on the .NET platform. Shawn even talked about how JGit is being used within the walls of Google to power the android.googlesource.com git repositories by stuffing git objects into BigTable. Heck, there are some instances that JGit is even faster than native cgit. In the end, it was nice to catch up with some old friends and even make some new ones this time around. A special thank you to the Google Open Source Program Office for hosting the event and providing some delicious birthday cake to commemorate ten years of the eclipse project.